I've had Showman for 3 years now and he only gets better with age. We have been through so much together. I have a couple daughters out of him and they are just as lovely as my handsome man. I was sure blessed with such a gift as him when God brought him along. I cannot thank Anne of Latte Da Dairy for breeding and raising such quality animals! And I sure can't thank her enough for helping me over the years and mentoring me in the ways of the goat world. Thank you so much for allowing such a special boy to come live with us here at Dair-E-Does! Because of his injury, losing a teat in order to save my sweet boys life, Showman will more than likely never get to show again. I am a little upset about this fact but not much. I still have an amazing buck with great genetics that will prove himself though LA and his offspring!! Picture taken April 2017 before the Big Buck Bonaza where he placed 4th, 2nd and four 1st! He went on to win Reserve under Tamara Taylor and then Grand & BIS under Justin Bassett! This secured 2 legs toward his permanent championship! GCH Latte Da B Stealin the Cash (Bonnie) 2*M (LA91 EEEE) Showman's dam. Photo courtesy of Anne Jones at Latte Da Dairy. 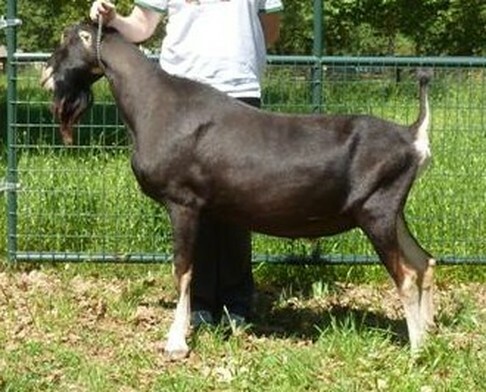 Latte Da Captain America (LA +VV 84) Showman's Sire. Photo courtesy of Anne Jones at Latte Da Dairy.